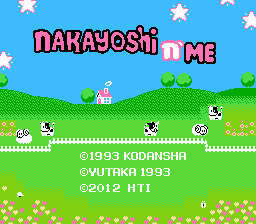 Nakayoshi to Issho is a role playing game for the Nintendo Entertainment System. The game features characters from Nakayoshi shoujo manga magazine. 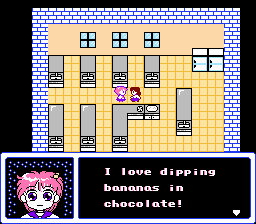 This is an English translation for a beginner-level RPG based on Nakayoshi Magazine. Nakayoshi Magazine is a Japanese publication that specializes in shoujo (”girl”) manga. 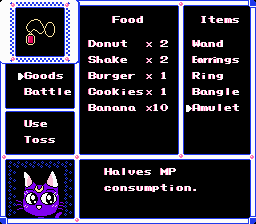 Several worlds exist in this game based on various manga that have appeared in that magazine, most notably Sailor Moon. The game also has worlds based on a bunch of manga that never saw official English releases, such as Goldfish Warning!, Pocket Park, MinMin!, Taiyou ni Smash and Kurumi and the Seven Dwarfs. As expected, this game is rather easy, and is quite simple, but it contains an interesting (if overly random) slot mechanic in its battles, and its diabetes-inducingly cute graphics are strangely appealing. 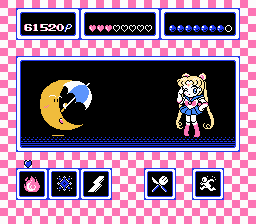 There are two versions of the patch, a “dub” version, which uses Sailor Moon character names based on the DiC Sailor Moon dub that aired on Cartoon Network in the 90s, and a “manga” version, which uses names that are more accurate to their original Japanese. Both patches are included in the zip file.